Stump the Rector – How do we apply the Laws of God? From at least the writing of St. Augustine, and more probably earlier, the Church has made a distinction between the laws of the Bible and placed them in three categories. 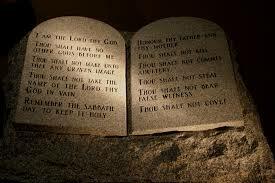 They are the moral law (think 10 Commandments), the ceremonial law (the sacrificial system, keeping kosher etc.) and the civil law (the laws of Israel as a nation). A distinction between the laws is not the invention of the Church. It can be seen in Scripture itself. There are a number of times in the Psalms and the Prophets where God rejects their sacrifices (ceremonial law) because they have not acted righteously (moral law). He would not accept their burnt offerings while they were oppressing the poor. The next question is which laws apply to us today? Jesus said that He had not come to abolish the law but to fulfill it, so one approach is to determine which laws He has fulfilled. Clearly as the Lamb of God who has taken away the sins of the world, He has fulfilled the sacrificial system. He was the One to whom all the sacrifices pointed and His once and for all sacrifice has ended it. In a similar way He has fulfilled the holiness requirements. Laws about eating only certain foods, what you could and could not wear, laws of clean and unclean were all external signs to declare a holy people for a holy God. But what these laws could not do is to change a person’s heart and so the prophets told of a time when God would turn the hearts of stone into a heart of flesh. It takes the love of God poured out through Jesus Christ to do that. It is the gift of the Holy Spirit that makes us a holy people and not what we eat or what we wear. Jesus fulfillment the holiness requirements is so complete that St. Paul declared that neither circumcision nor uncircumcision means anything. That was a profound paradigm shift in his day. Since the Church of Jesus Christ is made up of people from every tribe and language and people and nation it is obvious that we are not bound by the civil laws of the nation of Israel. In their nation they could execute witches and blasphemers and rebellious teens but those are not the laws of this nation. (Although there are days that we want to rethink that law about teenagers). This leaves us with the moral law. Is it still binding? Yes and Jesus tells us how to fulfill it. We fulfill it when we love God with all of our heart and soul and mind and our neighbor as ourselves. He said “On these two commandments hang all the law and the prophets.” He did not exempt us from the moral law. Here is a way to look at it. While it is obvious that Jesus death, burial and resurrection means that we no longer have to sacrifice animals, there is nothing about His death, burial and resurrection that makes it okay now to steal or to commit adultery. If anything His sacrifice highlights the importance of keeping the moral law. But there is an important caveat to add when we say that the moral law is still binding. Dallas Willard put it this way in his book The Divine Conspiracy. “The Pharisee takes as his aim keeping the law rather than becoming the kind of person whose deeds naturally conform to the law.” (p.184). Jesus has ushered in His kingdom and granted to us His Holy Spirit. It is as we live as kingdom people, loving God and loving one another, that we will naturally fulfill the demands of the moral law.